Leading supplier of end-to-end automated passenger authentication solutions based on biometric self-service processes. 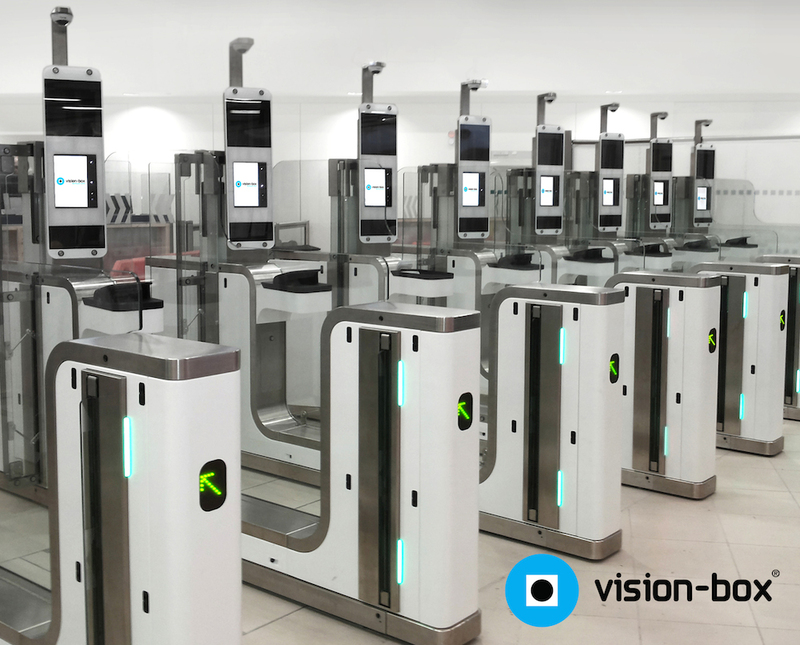 Vision-Box is the market leader in the delivery of enhanced self-service biometric-based solutions to airports, airlines and governments around the world. Dedicated to improving and accelerating passenger processing and movement through the airport, Vision-Box guarantees the highest level of security and an increase in non-aviation revenue. 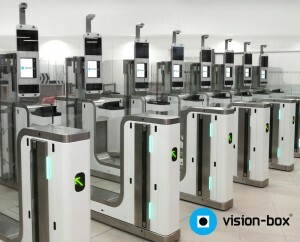 Vision-Box offers solutions that cover the entire spectrum of self-processing biometric solutions including check-in kiosks, baggage-drop biometric modules, modular eGate concepts adaptable to security checkpoint, Automated Border Control and boarding. 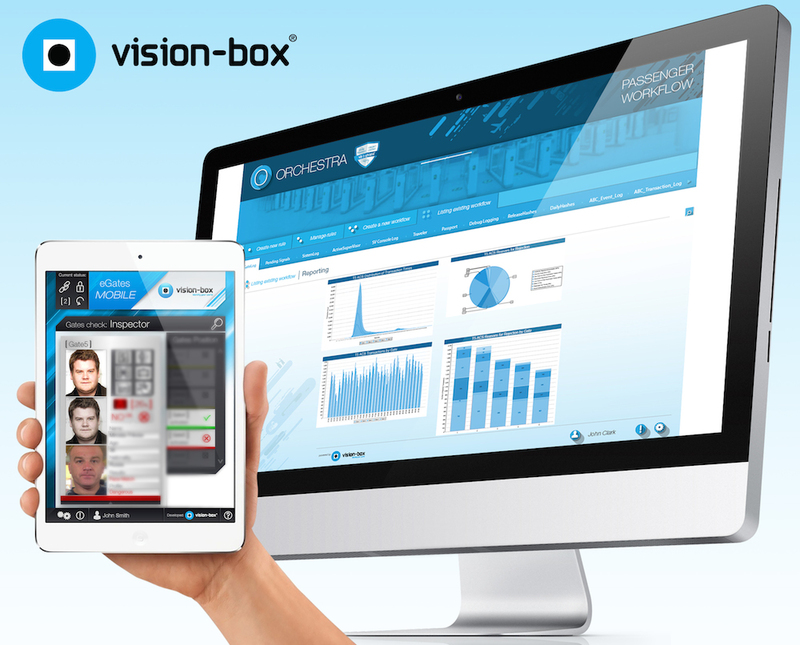 Vision-Box’s solutions are ergonomic, multi-biometric enabled and focused on self-service and hassle-free, user-centric processes while fully complying with ISO, CUPPS, AEA and NIST standards. An advanced management platform enables all passenger touch-points to integrate into an end-to-end workflow, coordinating the passenger process flow. This modular, multi-interface platform provides airport authorities with a real-time overview of every passenger’s identity and processing status, crosschecking biographic and biometric data with national and international security organizations’ databases. Additionally, it allows the monitoring of the entire security infrastructure. Vision-Box configures every airport flow on the principles of Privacy-by-Design, in compliance with the countries’ legal requirements. 80 million travelers use Vision-Box solutions every year at more than 50 international airports! How do we do it? Contact us! Security, Efficiency and a Unique Passenger Experience! A passenger moves swiftly through the airport to catch a flight, is recognized and allowed through security checkpoints by simply looking at a camera, on the fly. This is a scene reminiscent of a sci-fi movie. However, Vision-Box made it reality! Working with leading international airports around the world, Vision-Box understands the efficiency and security challenges that increased traveler volumes and a more sophisticated, demanding customer present. Having to endure long wait lines at the most critical points of the airport such as check-in, baggage drop, security, immigration, as well as burdensome identification procedures, it is understandable that passengers feel anxious trying to make their way across the airport. To address these challenges, Vision-Box designed a revolutionary end-to-end passenger and security solution called vb Happy Flow™. Integrating innovative self-service passenger touch points based on biometric identity verification to replace the traditional check-in to boarding procedures. This innovative passenger flow system dramatically improves passenger-processing time, while combining it with a powerful information and management platform guaranteeing an efficient and effective overview of the entire security infrastructure. Emphasis on the passenger experience is our objective: a seamless, fast, intuitive and secure ground process, streamlining the passenger experience and putting the individual in control of their journey. vb AIC™check-in kiosk – allows passengers to go through all check-in steps, verifying the passenger’s identity using biometrics and validating their electronic identity document. In all further touch points, the identification process is contactless; biometrics is the identification token. vb bag drop bio module – a secure & quick baggage drop upgrading module, based on biometric verification and match with the rightful owner of the baggage. vb i-match™ security checkpoint – identifies passengers using biometrics, ensuring that only passengers in the flight database are allowed through. vb i-match™ ABC eGates – the market standard, with over 800 units deployed across 50 international airports, automatically and efficiently expediting immigration processes and background checks. vb i-match™ self-boarding – the last step of the Happy Flow™ passenger departure journey, enables a swift identification of the passenger, guaranteeing that only eligible passengers on the flight list will board the aircraft. Information is combined and shared with authorities at every touch-point, ensuring complete privacy and complying with data protection principles and legal requirements. A powerful and unified software suite managing all touch points enable real-time monitoring of the entire passenger-flow infrastructure. vb i-shield™ is a unifying airport management software suite. This modular platform, created under the principles of Privacy by Design, make it possible for airport authorities to have centralized control of the entire common use and security infrastructure, managing and optimizing all passenger flow management operations, combining all airport touch points and security critical solutions, including the intelligent video-surveillance solutions, into a single comprehensive, open layer. Within vb i-shield™, vb inspector™ provides border guards and ground staff agents with real-time monitoring of all operations, including a live video overview of passenger clearance. This allows the immediate detection of identity fraud and Visa overstays, triggering instant alarms, warnings and various intelligent reports. Additionally, vb i-shield™ produces management information, performance monitoring, auditing, workflow configuration, confidentiality management among other reports. Receiving information from various sources and translating it into intelligible data for decision makers as well as building predictive models, output is shared on multiple interfaces for different stakeholders, in accordance with ATI Standards (IATA, AEA, ACI). It securely and natively integrates with Advance Passenger Information Systems, Common Use platforms (Passenger, Flight, Terminals, Baggage, …), Departures Control System, Registered Traveler Programs (RTP), Entry/Exit Systems (EES), Watchlists, VISA, and others. Happy Flow™ means a boost in the passenger experience and airport stakeholders take great advantage of this approach. How? 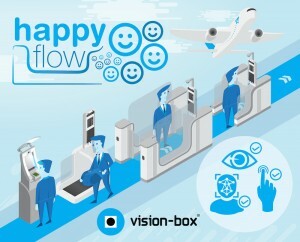 The installation of Happy Flow™ allows airports to manage passenger data intelligently, analyzing their journey across all touch points, drawing conclusions on behaviors and trends, follow proactive approaches to passenger flow and staff allocation, anticipate flight delays, traffic peaks and congestions. Biometric self-service solutions replace traditional manual procedures prone to error and improve security checks. Integrated with robust hardware, this efficient control platform makes it possible for airports to identity potential threats and actually manage traffic and access to security areas. With intelligent self-service processes, a stunning and stylish experience replaces waiting and anxiety, leaving more time for the passenger to relax and enjoy the airport retail areas. 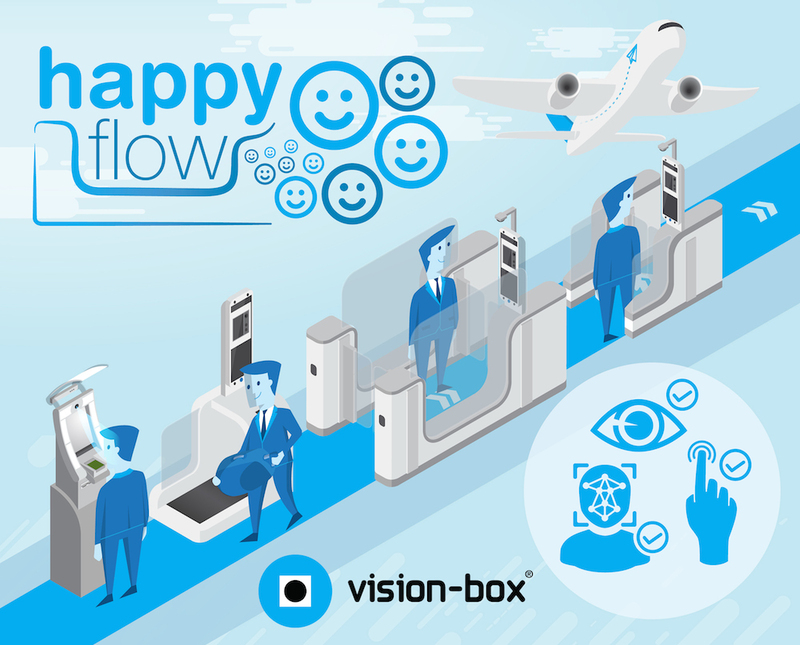 Happy Flow™ is on the innovation edge of the passenger experience, offering speedy processes, on-the-move interactions and a happy journey. Managing the entire passenger flow through the airport opens an entirely new range of possibilities for airlines, optimizing resource allocation, meaning more on-time flights and a boost in customer loyalty. Border Control authorities also benefit by automating the process, improving security options and freeing relevant resources for sensitive situations.